Job cuts announced this year have already surpassed last year's total. NEW YORK (CNNMoney) -- Private-sector payrolls surged and planned job cuts eased in November, indicating some improvement in the job market and raising hopes for the government employment report due later this week. In a separate report from outplacement consulting firm Challenger, Gray & Christmas, layoffs announced in November dropped slightly from the prior month -- though cuts in 2011 have already surpassed last year's total. Challenger said 42,474 planned layoffs were announced in November, down 0.7% from October's total. That's the second straight drop after September's 28-month high of 115,730. But job cuts announced this year are up 13% overall and now total 564,297 -- already more than 2010's full-year total of 529,973 -- with one month to go. The reports come two days before the Labor Department issues its intensely watched monthly employment report. 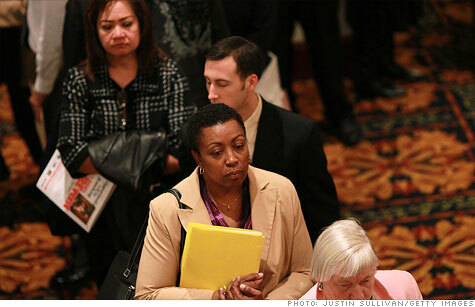 A CNNMoney survey of 21 economists forecasts that the economy added 110,000 jobs in November. That's compared to October, when 80,000 jobs were added to payrolls. "Over the past six months, we definitely have seen a shift away from the heavy government job cuts at the state and local level toward increased job cuts at the federal level," Challenger, Gray & Christmas CEO John Challenger said in a press release. "The worst may be yet to come, as cutbacks spread from the military to every other agency in Washington."